I like Tea. I like Bubbles. Cool. 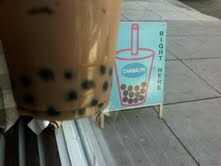 It sounds like a match made in heaven to be introduced to a new drink called `Bubble Tea` at Chamalyn in the Mission. Bubble Tea‘s are fruit milk containing `bubbles` made of chewy tapioca balls. Kind of like a milk shake with weird chewy bubbles inside. I’m impressed! Certainly tasty and different, I’ll be working my way through the different flavo(u)rs. This entry was posted in Tea and tagged Tea by bulmer. Bookmark the permalink. We had that in Vietnam. Think it’s a Korean thing.